The Homer – the car designed for the average man. Tonight we’re going to witness automotive history … Powerful like a Gorilla … yet soft and yielding like a NERF-ball. Two bubble domes – a second sound proof dome for kids (comes with optional restraints and muzzles). Three horns – to play the song “La Cucaracha.” – as you can never find a horn when you’re mad. All this can be yours for the $140,000 USD (inflation adjusted). I hope everyone enjoyed the last night’s LEGO Simpson’s episode last night. 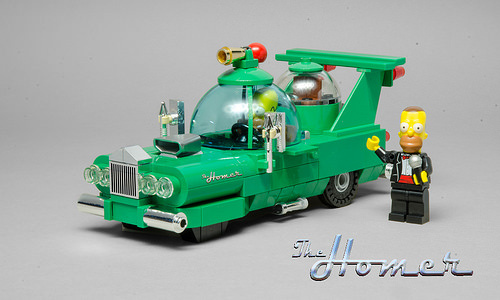 And I’m glad that Brian Williams built this amazing version of the classic car Homer designed way back in season 2! “Powerful like a Gorilla … yet soft and yielding like a NERF-ball” – they don’t write dialogue like that these days.